Entirely in Russian but with good diagrams. This Russian language book is 7-1/2 x 10-1/4 inches, 100 pages, softcover and printed on newsprint. There is a section in the middle of color pictures which are very nice considering the paper they are printed on. The flowers in this book use the Victorian technique and there are numerous diagrams. 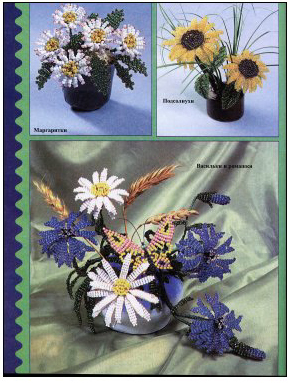 Instructions are included for Daisy, Pansy, Forget-me-nots, Lily, Poppy, Sunflower and others. This book is part of my personal collection and is not for sale. However, if I should come across another copy it will be made available via the Beaded Flower Newsletter. Click here to sign up. This Russian language book is 8 inches x 10-1/2 inches, 87 pages, hardcover. The flowers in this book use the Victorian technique and French technique. There are good diagrams and it's very clear with diagram goes with which flower. This Russian language book is 8 inches x 8-1/2 inches, 165 pages, hardcover. 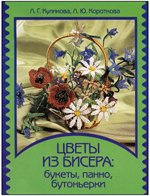 The flowers in this book use thread based stitches such as right angle weave and petyote. 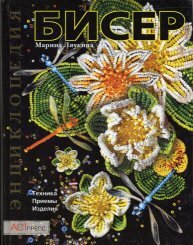 There are good diagrams in this book which contains jewelry flowers which incorporate flowers as well as other types of jewelry. A mixture of French and Victorian techniques with easy to follow diagrams so you don't need to know how to read Russian. I love the interesting shaped Victorian technique leaves that are diagrammed. My favorite in the book is a berry branch using large oval beads for the berries. There are also two butterfly patterns. If you like this technique (I love it) then you'd also like Dimensional Flowers Leaves and Vines and My Beaded Garden.